I was sorting through a box of odds-and-ends and found a box of these, Memorex double sided, double density 8 inch diskettes. 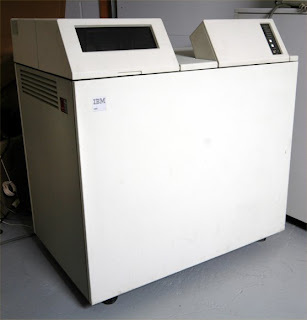 I first encountered these when working on a IBM System/36 model 5360. 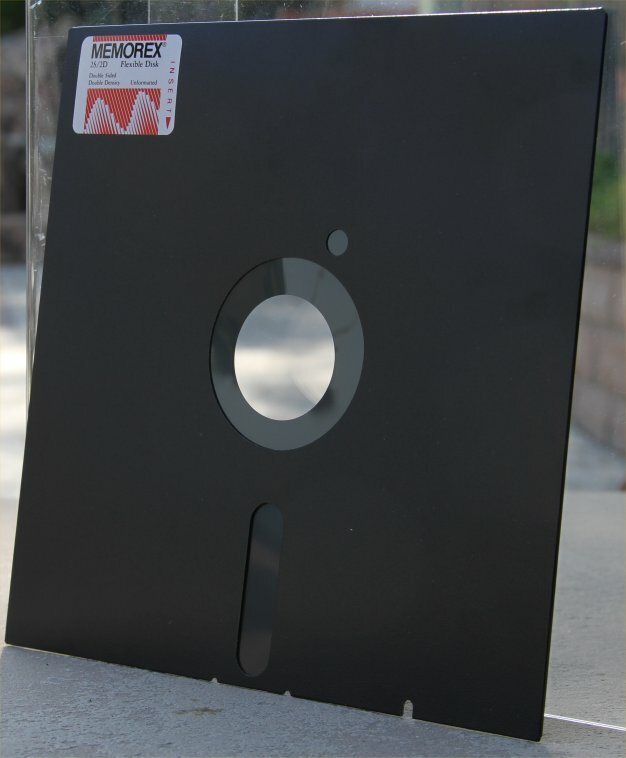 All the backups were made to these, which were contained in two magazines of ten diskettes each, and four in the "rack". 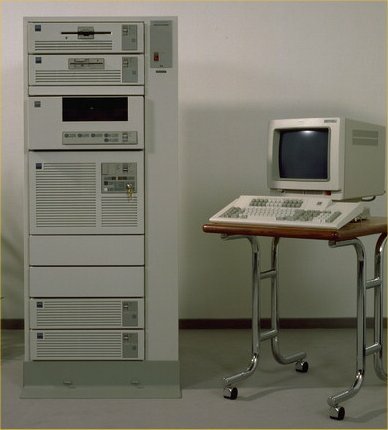 Shortly after my joining the company they leased an AS400 B30, which had a single diskette slot. I spent hours running the System/36 to AS400 conversion aid tool to convert and copy the programs and files from the System/36 to the AS400. It was a tedious process first waiting for the libraries to be saved to the diskettes in the magazines on the 5360, and then loading the diskettes individually into the B30's diskette drive. I remember these, although we mostly used these huge tapes to do our backups. The tape drive was large enough to make a picnic on top of it and all the lenses had to be cleaned on weekly basis or the backup would fail. I really enjoyed working on these systems specially the System/34 and System/36. Oh those wonderful SEU, creating running procedures with informative instructions. It was really fantastic machine to work. When I started to work, S/36 was major product in the midrange market. Also I was in charge. I had no chance to see but, I heard that in our show room, there seems to be AS/400I model A30. I wish I had a chance to see. I love those one! Must have been thousands that i put from boxes, out of the sleeves, into magazines, magazines in the machine, doing saving/restoring, taking them out of the machine, out of the magazine, back into the sleeves and back to the box. Forgot to mention the stickers. Those full written had to be peeled off and replaced by a new one. That was - apart from taking the wrinkled, "cheap" floppies out of the feeder/slot and starting all over - the part i hated most. 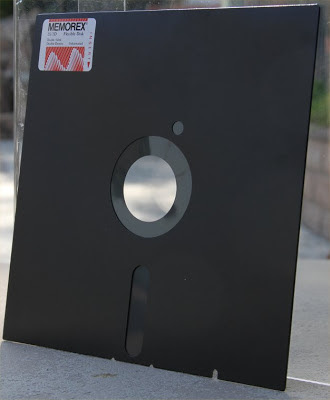 I hate to date myself... but I recall using the single density and learning that if we covered the small hole in the diskette and punched one in another spot it became a double density. I never heard of that trick but I did flip them over and use a hole punch to punch a hole on the back side. We then dropped them into a 3741 and initialized the back side. I guess in a way that sort of made it a "double" something. I wish I had heard of your technique. Also used them for transferring shop floor data from Series/1 to System/38. I actually has some saved also and was able to get ahold of a 9402/436 with a diskette drive and was able to restore them. As luck would have it there was a copy of a common library that had some games in it that I restored on my iSeries and still worked. I went Sys/3 Mod 10, Sys/32, Sys34, Sys36 to iSeries great machines and wouldn't change a thing. First job out of college used 3741s and 8" floppies to replace 80 and 96 column cards. Had their own formatting language, and some even ran RPG II. We were a S/3 shop then, when 10meg disk packs were state of the art. Still have a thousand or so 8 inch diskettes and the magazines to go with them back in a warehouse w/a couple of sys/34's, one sys/36baby, sys/36 5360 and an operating advanced as/400 436 operating as a sys/36.